My love of koi first began in 1972 when my late Father bought 5 koi from Belle Vue Aquarist Festival in Manchester and had to put them in the bath overnight because the garden pond, which he already had, needed a couple of minor adjustments! It wasn't long before I became heavily involved with The British Koi-Keepers' Society – both at section level (The Northern Section) and national level - and with The Northern Koi Club when it was first formed in 1993. In 1992 Sue & Tony McCann (now of Your Koi) suggested that the four of us went on a trip to Japan. The photo to the right was possibly the best koi we bought on the first trip - a Sanke. Unfortunately it never actually arrived in the UK – we don't know whether it had died, got lost or whether the breeder simply decided to keep it. Needless to say, we were completely smitten and went again in 1995 but, this time, also visited koi ponds in Taiwan and Hong Kong. The four of us also visited koi ponds in the USA and Belgium on other trips. Needless to say, when we look back at the koi we purchaed on those first two trips to Japan we realise how silly we were as, although we purchased some nice koi, we went for quantity rather than quality. Nevertheless we shall always be indebted to Sue & Tony for arranging the various trips – without whom we would probably never have had the opportunity to visit. In 1997 Mike went to Israel with Cascade Water Gardens to visit five koi farms with a view to making a video on Israeli koi. I was disappointed at not being able to go with him but, in October 1997, I got a phone call asking if I would still like to visit the koi farms in Israel in January 1998. The deal was that Dave Dyson of Cascade Water Gardens and Colin Wilcox of SWL Ltd were prepared to fund me to go to Israel if I would write a series of articles on the koi farms for Koi Carp magazine in order to help promote Israeli koi. I had to have time to think about it - it took me all of two seconds! I subsequently wrote a series of 5 articles for the magazine. I was able to visit Japan again in 2008 – some 13 years after my last visit. As Sue & Tony of Your Koi were now arranging annual trips to Japan it made sense to go with them. At the time Mike and I owned an aquatic store and I was going with the intention of buying koi to sell so, when selecting I was looking for koi which I knew our customers would like. There was another dealer on the trip as well as two koi-hobbyists. So, having not had a personal koi pond for 8 years, we have decided this time to purchase not only better quality koi but also ones that have potential for improvement in the future. In the past I always tended to purchase 'finished' koi, i.e. they probably wouldn't improve and whilst Mike tended to buy small koi, with a view to growing them on, they weren't particularly high quality which meant that, although the koi grew, their pattern didn't necessarily improve. In August 2011 some members of The Northern Koi Club opened their ponds and gardens for a Sunday afternoon for members to visit. We had, in fact, opened our own garden in June as, even though it was only a hole at that stage, members do like to see ponds in progress but, in any case, the garden itself was beginning to take shape. As Sue & Tony are members of the club they also opened their pond – they have their own personal pond as well as two additional ponds from which they sell from. As they were due to go to Japan again in October they had decided to have a sale of some of their koi in what they classed as 'Bargain Basement'. Before I knew it, Mike had purchased two of these koi – I don't know who was more staggered - me or Sue & Tony – as Mike is not known for impulse buys. About a week later Tony offered us a good price on another koi which he knew we had both admired and, needless to say, we succumbed! He agreed to hold the koi until he went to Japan in October as we said our pond would be well finished by then! Well, we were only 10 months out! Whilst in Japan, Your Koi, were putting photos of koi on their Facebook page as well as sending e-mails to customers so we couldn't wait to see the koi when they arrived in the UK. As Tony wanted a hand to move some koi from one pond to another I offered Mike's services – this gave us the opportunity to really study the new koi and we subsequently purchased another three. There was another koi which I particularly liked and having seen its pattern improve within the first few weeks of arriving in the UK, I decided to purchase that as well. 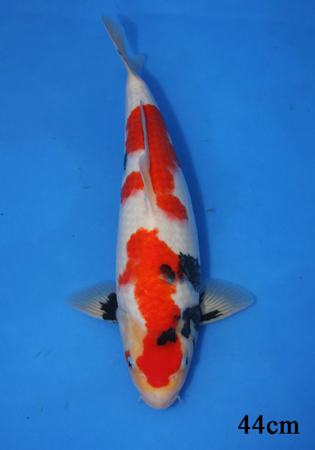 The first three koi were introduced to their new home on 16th June, 2012. The first one (left) was bought from Your Koi in August 2011 and the other two in November 2011 – all have been sharing board and lodgings at Your Koi since! It was interesting to note that the middle koi below (Oomo Showa) had grown from 40cm to 47cm in the 6 months it was at Your Koi. In March 2013 Your Koi purchased 12 Matsunosuke Gin Rin Kohaku ranging from 26cm to 33cm to sell to their customers with a view to arranging a 'Grow and Show' Competition. All koi were photographed, measured and given a number. Each number was put into a sealed envelope. In order of purchase, each purchaser then drew one of the envelopes and had the koi appertaining to the number inside the envelope. We were fortunate to draw a 32cm Gin Rin Kohaku. All we have to do now is ensure it eats plenty of food during the summer months! It was put into our pond on 6th April, 2013. Below is a 37cm Matsunosuke Goshiki! Even though it looks very much like a Kohaku at the moment, Mr Sakai assures us that it is a Goshiki. Only time will tell and, as the old saying goes, watch this space! Put in our pond 6 April, 2013 The same koi - nearly 12 months on (31 March, 2014) having grown from 37cm to 43cm! 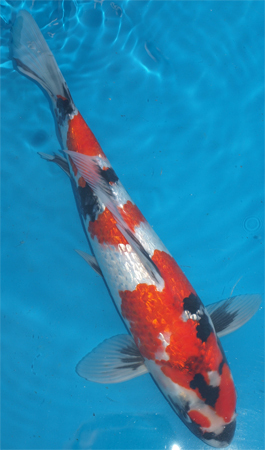 GROWING-ON 1: In addition to the above-mentioned koi we have purchased, through Your Koi, a 35cm Tosai Oomo Kohaku. 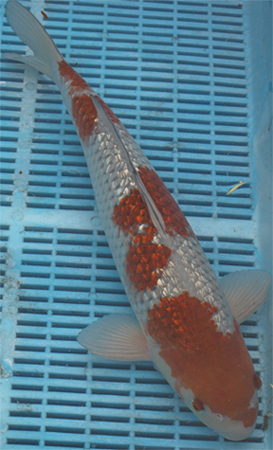 (Tosai means one-year-old; Oomo is the name of the breeder of the koi). This koi was put into one of Oomo's mud ponds in Japan in May 2012 and was left there to grow on over the summer. The mud pond was netted in October when it measured a staggering 53cm. 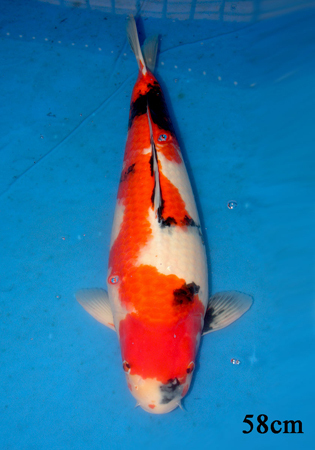 The Kohaku came back to the UK in November 2012 and has remained at Your Koi's premises since. We had hoped to bring this koi to our pond in April 2013 but, unfortunately, it developed a sore on its side and so we decided to leave it at Your Koi for the time being as we felt it could make it worse by catching and transporting it. 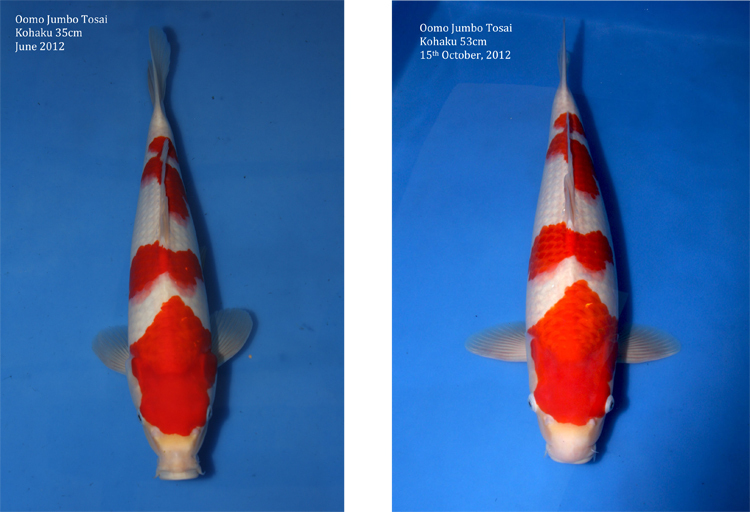 LEFT: Finally, on 3rd May, 2013 we were able to bring her home and the area of the sore is virtually invisible – thanks to Your Koi for their dedication in ensuring the Kohaku was back to full health. She soon settled in and within a short space of time the damage was completely invisible, she has been feeding well and the colour, now she is outside, has improved considerably. Although many UK koi dealers and hobbyists regularly grow koi on in Japan – sometimes they can be left for 2, 3 or 4 years – it was the first time Mike and I had ever done it and it was a really exciting time. So much so, that we opted to leave another koi to grow on – this time it was to be left for 12 months. 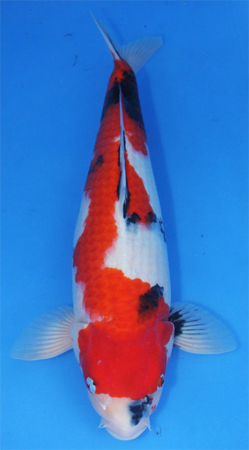 As the above Kohaku (Growing-On 1) had done so well, we decided to partake in a similar offer in 2013 and purchased a Tosai Oomo Showa at 20cm in May 2013 (again through Your Koi) just prior to it going into the mud pond. 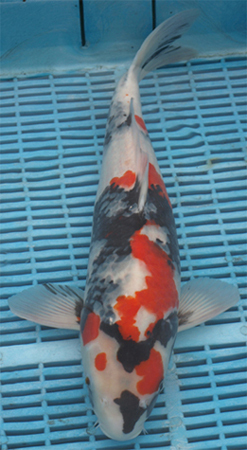 Bought from Your Koi 22nd, July 2013 Taneka Kohaku – won in the Northern Koi Club's 20th Anniversary raffle! The koi had been donated by Your Koi. 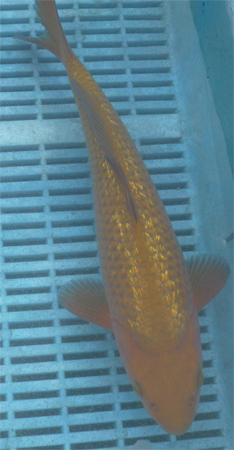 Below is a short video clip of the first seven koi eating a week after they had all been added to their new home – June 2012!